For other uses, see Shrug (disambiguation). 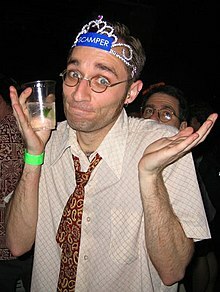 A shrug with a tiara, a drink, a dress shirt, and a loose necktie. A shrug is a gesture performed by raising both shoulders, and is a representation of an individual either being indifferent about something or not knowing an answer to a question. A shrug is an emblem, meaning that it integrates the vocabulary of only certain cultures and may be used in place of words. It can also be used when simply ignoring a question. It may be accentuated with raised eyebrows, a turned-down mouth, an exaggerated frown, and raised palms. It is very common in Western culture—rather than saying "I don't know", one may simply perform a shrug. In the English-speaking world it may be accompanied by a three-syllable grunt or hummed mumble mimicking the intonation of "I don't know" (low-high-low). Shoulder shrugs are among the symptomatic tics of Tourette syndrome. The shrug gesture is a Unicode emoji included as U+1F937 路 SHRUG. The shrug emoticon, made from Unicode characters, is also typed as ¯\_(ツ)_/¯ . ^ "Shrug | Define Shrug at Dictionary.com". Dictionary.reference.com. Retrieved 2011-12-20. ^ "Anxiety/panic disorder most frequent disabling comorbid disorder in Tourette syndrome patients, study finds". 2010-06-19. ^ "Shrug Emoji". Emojipedia. Retrieved 2016-01-17. This page was last edited on 8 April 2019, at 01:28 (UTC).